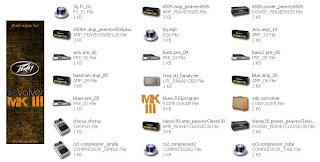 There are 75 types of files created by Peavey Revalver MKIII. Browsing moduleparams directory might be awkward due to lack of visual aid. Shell icons should be of great help here. Download Shell icons for Peavey Revalver MKIII files (480 KB) The executable file is a self-extracting RAR archive.